This Lemon Butter Chicken is a must try recipe! 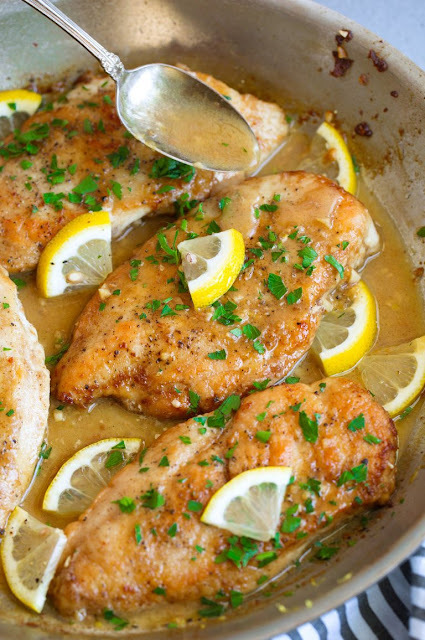 I’m all about lemon chicken so when you add a butter pan sauce to the mix you know it’s going to be unbelievably tasty. And not only that this chicken is so easy to make and it will come together in no time, making it the perfect dish to serve any day of the week. One of my go-to side dishes for chicken like so is steamed or roasted asparagus or broccoli, then I also like to serve it with orzo. Cauliflower rice would also be a good healthier alternative to the orzo. I love how that bit of extra sauce goes with the orzo, perfect match. Plus orzo is so lazy and easy. Place flour in a shallow dish then dredge both sides of chicken breasts in flour, one at a time. Heat 12-inch skillet over medium-high heat. Add olive oil and 1 Tbsp butter, let butter melt, then add in chicken breasts in a single layer. Sear until golden brown on bottom, about 4 - 5 minutes then flip and continue to cook until chicken registers 165 degrees in center, about 4 - 5 minutes longer. Transfer chicken to a plate while leaving any little bit of excess oil in pan. Reduce to medium heat, add garlic and saute 20 seconds, or until just lightly golden brown, then pour in chicken broth while scraping browned bits up. Pour in lemon juice then bring mixture to a simmer, reduce heat slightly and let simmer until liquid has reduced by about half, about 2 minutes. Add in remaining 3 Tbsp butter and lemon zest, stir to melt butter. Return chicken to skillet, spoon sauce over chicken and garnish with parsley. Serve warm. *2 (10 oz.) chicken breasts may be used instead. Then simply butterfly and halve the breasts (cut through the thickness of the 2 large breasts), to create 4.